Like any game, Splatoon went through many different changes while the game was being developed. This page lists all of those changes that we know of. The 5 November 2014 Nintendo Direct showed off what would later be known as Octo Valley for the first time. 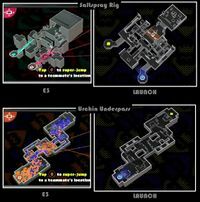 However, there were many differences compared to the mode in the final release. In the prerelease version of Splatoon, there were garbage bins near Inkopolis Tower. In the final game, it was replaced with Cap'n Cuttlefish's manhole to the entrance to Octo Valley. The entrance to Octo Valley is Cap'n Cuttlefish's manhole. However, back then, the location of the manhole was slightly different. It was still in a corner, but there were no trash cans or a vending machine nearby. This might have been a totally different location, or perhaps the trash cans and vending machine were added later on. Prior to the game's release, it showed a white wall behind Cap'n Cuttlehish's manhole, which mean it could've been near Shrimp Kicks or probably somewhere close to Booyah Base. But this could also mean that Cap'n Cuttlefish was actually at the location where Spyke is in the final game. Another difference is that the lid of his manhole is not a grate, like in the final game, but a flat, solid, surface. In the prerelease version, the player had five lives; in the full game, this was shortened down to three, presumably for a little more challenge. In addition, the outline for the Sunken Scroll is different from the outline in the final version. Here, it looks more like an outline for 2 sheets of paper rather than a scroll itself. As with many games, the light engine was much darker in the prerelease version. In one part of the trailer which appears to be in a level similar to the final game's Shifting Splatforms, a normal, standing Shielded Octotrooper can be seen firing ink rapidly. In the final game, this trait is only given to Twintacle Octotroopers, as normal Octotroopers will only fire one blob of ink at a time. An unused Octarian variant can also be seen in the video. It appeared to be a tall enemy, wearing what appears to be a cloak, and was supposed to appear in a pool of ink. It is unknown if this was an early Octosniper, or just a different cut enemy. Various changes in the multiplayer modes can be seen, including map differences and minor cosmetic differences. Signals are different. In the prerelease version, there is one signal with the text "Signal" rather than two signals. An unused color known in the database as "Moth Green" was to be used in Octo Valley, and presumably multiplayer. It was shown in several trailers and images as dull green. It is also seen on the back cover of the Splatoon disc case. 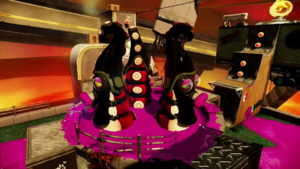 Footage showing the Dynamo Roller in the Octo Valley trailer showed that its roller head, and presumably all other roller's heads didn't fold to the side while standing still or running in humanoid form. The Classic Squiffer initially had Burst Bombs as its sub, according to the Octo Valley trailer. Early concept art and the Octo Valley trailer showed the Rapid Blaster had the bottom part of the Rapid Blaster Pro attached to it. The Disruptor initially lacked a handle and was a black ball. Early Inkstrikes strongly resemble rockets and were colored grey initially. The Sprinkler's metallic portions were originally much thinner. The Squid Beacon had the shape of a flag and lacked any satellite-like elements. The Suction Bomb was originally a small ball. The Splash Wall originally was a white contraption that stands on a long stand, indicating the ink from the Splash Wall was originally shot upwards. The Burst Bomb initially has more of an oval shape, and the lines stretching around it were less straight. The early Bubbler icon was more transparent and lacks the silhouette of an Inkling. A recolored Inkzooka named "BigLaser" in the files. Presumably, this was a placeholder for the Killer Wail, as its Japanese name translates to "Megaphone Laser". A pre-release image for Splatoon shows an inkling using what is either an unused scoped charger or a Splatterscope with an unused skin. Comparisons between the appearance of Saltspray Rig and Urchin Underpass at E3 and in the final game. An early version of Arowana Mall was slightly thinner, had overhanging roofs and pillars along the side, and featured a thin gate towards what appears to be the center of the stage. Blackbelly Skatepark originally featured stairs near the ends of the stage and at the entrance to the central area surrounding the tower. Saltspray Rig originally had small areas further to the left and right of the stage, and the bottom platform was split into two and could only be accessed from the sides. The center of Urchin Underpass was originally larger and had two central entryways from each side instead of one. Camp Triggerfish originally had a lot less walls to defend players. The overall layout was much wider and open compared to when it was released. An early version of the Varsity Jacket featured a grey and brown color scheme and a different logo. It was referred to as the Varsity Hoodie in Splatoon's files. A shirt referred to as Shirtstavaganza has an unused icon in Splatoon's files. Shirtstavaganza would have been light blue and featured navy and red markings across the entire shirt. The Round-Collar Shirt was originally intended to be gray. The Reel Sweat was originally supposed to be gray as well, and was even originally referred to as the Gray-Reel Sweat (Grey Reel Sweat in European versions). The Purple Camo LS initially featured a lime green armband instead of the final's orange one. A T-shirt called the White Puffer Tee was cut from the game. It prominently featured a modified version of Firefin's logo. The Layered Anchor LS was originally supposed to be dark grey. The early Purple Camo LS. The grey Layered Anchor LS. Shown in some screenshots, Inkopolis Plaza had a slight redesign before the game was released. All of the changes were aesthetic, and did not affect the Plaza. The alley where Spyke resides in the final game was originally where the porthole to Octo Valley was. 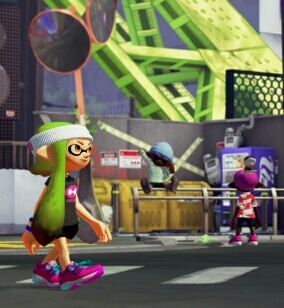 In the final game, the porthole was moved to the right side of the Inkopolis Tower near the vending machines. The Squid Sisters' studio did not have a background and had the sisters stand near the television instead of sitting on the two seats in the final game. There was originally a tree next to Cooler Heads that was removed in the final game. A lamp pole near Spyke's alley was removed in the final game, as well. The yellow concrete arrow near Inkopolis Tower originally pointed upwards and was shaped like a squid.